9 months of study changed the course of Matilda Smith’s life. 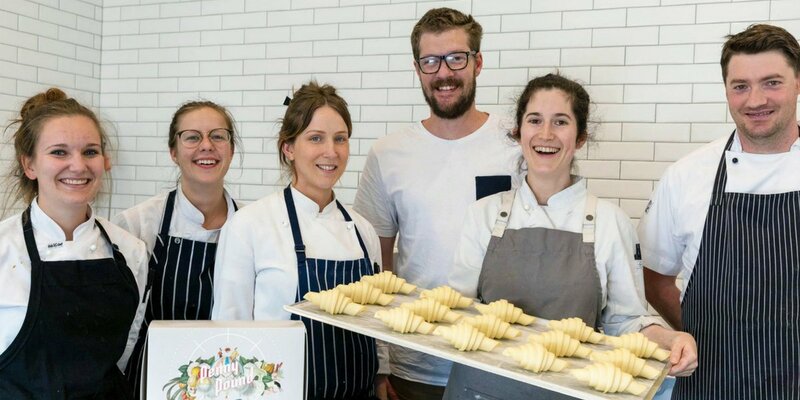 A mature age student when she started her Diplôme de Pâtisserie (Certificate III in Patisserie), the hard-working owner of Penny for Pound now employs 6 full time staff, produces thousands of pastries each week and has a retail expansion underway. In 2018, her thriving business featured in Epicure, Good Food, Broadsheet Melbourne, Urban List and Concrete Playground, and won ‘Best Donut in Melbourne’ at 2018 DonutFest. It was Matilda’s mum, a devoted Francophile, who encouraged Matilda to study at Le Cordon Bleu. Matilda had never intended to pursue a career as a pâtissière, but today, with a job she adores and a thriving business, she is glad she did. Le Cordon Bleu Sydney provided me with a great foundation in all areas of patisserie, we had some of the best teachers and facilities in the world. A Work Integrated Learning Industry placement at Merivale in Sydney gave Matilda a range of impressive skills and experiences, from plated desserts and wedding cakes, to interactive dessert bars and creative food installations. Staying with the company for over 2 years, she enjoyed two promotions, first to Chef de partie, then Pastry sous chef. After moving to Melbourne to be closer to family, Matilda worked at the acclaimed Burch and Purchese sweet studio creating Easter eggs, Christmas figurines, edible gardens and artworks. Her team’s work was featured in Delicious magazine and the Age Good Food Guide. 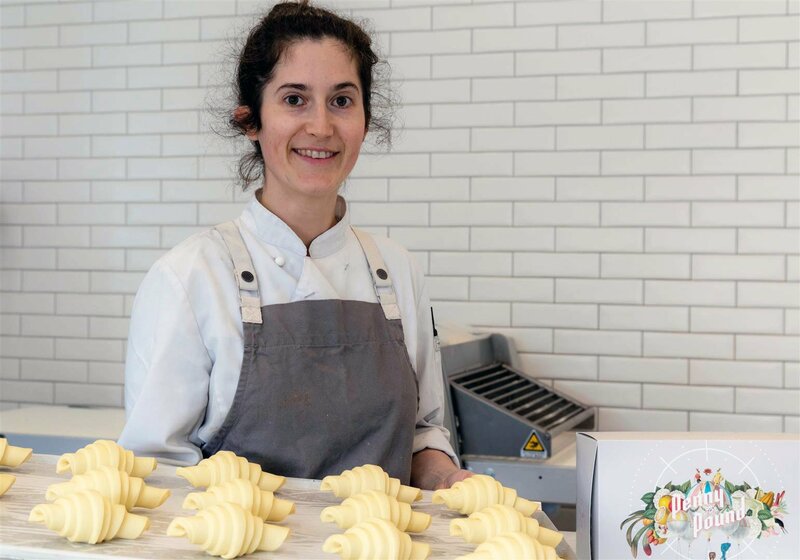 With the absolute goal of becoming a well-rounded pastry chef, Matilda set her sights on mastering the art of viennoiserie (creating baked goods from yeast leavened dough). She chose her next job at a small wholesale bakery with a view to mastering this skill, working on the night shift (starting at 1am) and doing everything necessary to achieve this end. When the business closed down one week later, her whole team was out of a job. More determined than ever to open her own business, Matilda was offered a lease on a vacant commercial space and jumped at the chance. She and her partner Ben completely refurbished the interior which became home to her wholesale business Penny for Pound. Matilda bought and assembled a heavy pastry sheeter in the lounge room of her tiny one bedroom apartment to practice making croissants, which she did every night! The name ‘Penny for Pound’ is symbolic of Matilda and Ben’s dedication to see the venture through, no matter what. And they are living proof that hard work and determination pays off. "Opening a small business is really hard. The hours, the stress, the lack of sleep. I had 2 days off in our first year of trade, but you make sacrifices for the things you love. But let’s be clear, I love what I do. I love what we have achieved as a business, and the tight knit team that we have built so far." At Penny for Pound attention to detail sets them apart. Their laminated products are considered a specialty, namely, fresh hand-made croissants and pastries. The ‘cruffin’ has been a popular product – a croissant shaped like a muffin, filled with creams, custards, lemon curds in different flavours. The business grew by word of mouth, with the first 15 customers arriving through social networking. Matilda used social media as her main marketing tool and even hired her staff through Instagram. The future looks bright for this driven alumna, who is currently expanding her establishment to offer a retail area where her customers can sit down and enjoy her gorgeous pastries with a coffee. There is no doubt Penny for Pound will continue to thrive and expand in the long term. Above all, believe in yourself. You can do it, and you will get there. But no one can do it alone, so surround yourself with the best people. Le Cordon Bleu is a very special school, and I encourage you to use their networks.